THIS MAY BE THE EASIEST DIY PROJECT YOU WILL EVER DO AND IT WORKS SO WELL. 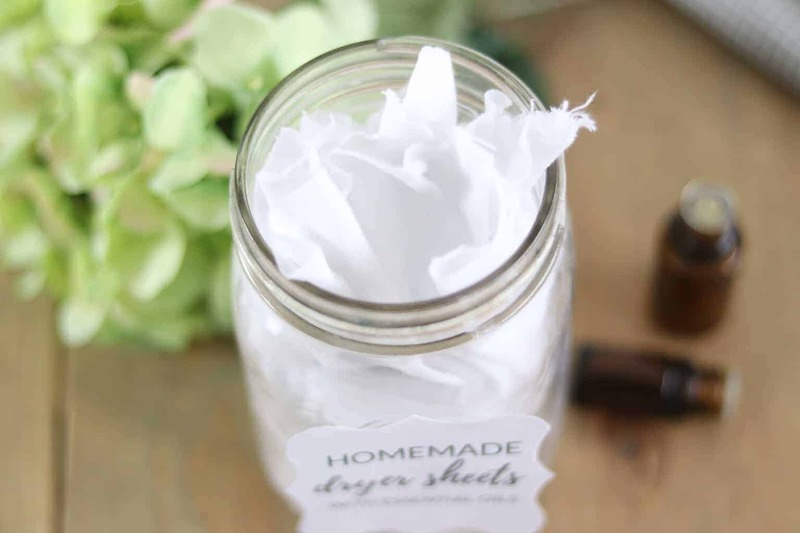 TODAY I AM GOING TO TEACH YOU HOW TO MAKE NATURAL DRYER SHEETS WITH JUST 2 INGREDIENTS! One of my absolute favorite smells is clean clothes in a dryer. You know when your outside, near the dryer vent, and you can smell the fresh laundry smell? Oh man, I love that! That particular smell reminds me of being at my Grandma’s house as a kid. Once I stopped using conventional laundry detergent, fabric softener, or dryer sheets that smell became less familiar to me. However, now that I use essential oils it is better than ever! When I first starting making my own soap I was lazy and cheap, and didn’t always add in essential oils. The soap still worked great, but I missed that fresh clean smell. Now I always add essential oils, and now that I am using these dryer sheets, my laundry smells even better. Plus, they work well at softening the clothes. 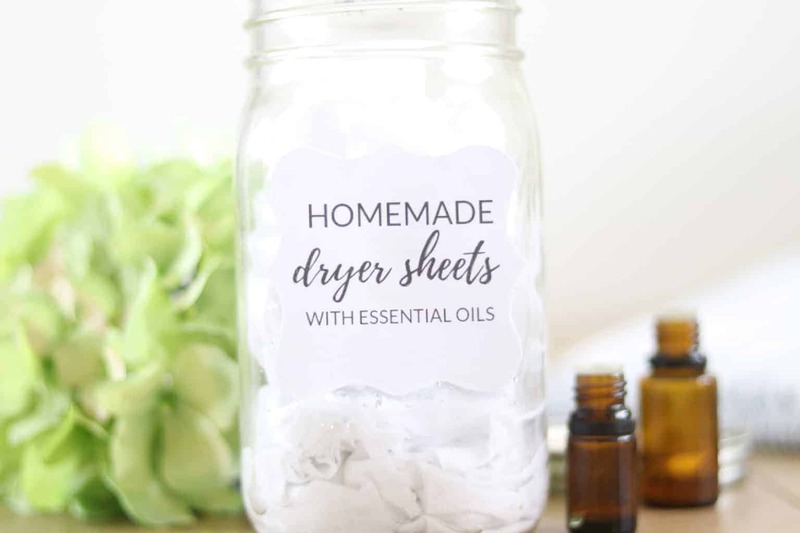 Keep reading to learn how to make natural dryer sheets with essential oils! Get my homemade laundry soap recipe here. Ready to get toxins out of your home? Grab my FREE ebook with my favorite DIY all natural products! Mix the vinegar and essential oils into a small bowl and stir until well combined. Cut old cotton t-shirts or fabric remnants into 5 inch squares. You can also use reusable cotton baby wipes. Fold the fabric pieces to fit inside of a mason jar or other airtight container. Pour the vinegar and essential oil mixture over the cloth wipes. I made 12 cloths and used all the liquid. If you make less you may not need all the liquid. You don’t want to saturate them. Add 1-2 cloth dryer sheets per load. Before putting the cloths into the dryer squeeze access liquid back into the storage container. These double as a fabric softener and dryer sheet. The vinegar helps to soften clothes and leaves no residue on the laundry. Don’t worry your clothes won’t smell vinegary! As the clothes dry the vinegar smell will go away. The essential oils will add a beautiful scent to your clothes and you can customize it to smell however you want. I share my favorite oils to use below. The vinegar and essential oils both help to reduce static. When it comes to laundry I like to stick to floral and citrus smells. Sometimes I just add one oil and other times I like to do blends. Here are a few of my favorites. 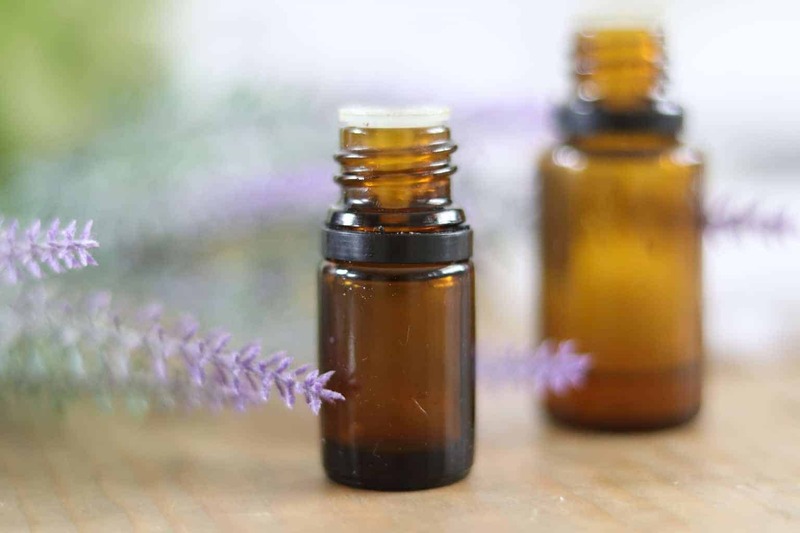 LAVENDER- Lavender is a very calming, relaxing essential oil, with a lovely floral smell. This one is my favorite for laundry soap and dryer sheets. ROMAN CHAMOMILE- Another calming essential oil and great for kids. Roman chamomile adds a beautiful floral scent and is sensitive enough for baby clothes. PATCHOULI- Either you love it, or hate it. I am a patchouli lover and am obsessed with the scent. This is another favorite of mine for laundry. JASMINE- If you want to smell like a bed of flowers all day, then add jasmine to your laundry routine. Jasmine is very calming and can help with stress and anxious feelings. WILD ORANGE- Invigorating, uplifting, and cleansing; wild orange is perfect for your natural dryer sheets. It adds a fresh scent to your clean clothes. LEMONGRASS- This citrus oil has a earthy smell and makes a great scent, especially for men. LEMON- Lemon just reminds me of clean! It is a very purifying and cleansing essential oil great for laundry. MELAEUCA- Melaleuca is a purifying and cleansing essential oil. If you ever forgot to put wet laundry straight in the dryer when it is done add 2-3 drops to the wet clothes and add to the dryer. It will take that musky smell right away! PEPPERMINT- If you like a fresh, minty smell then this well be your oil. Peppermint makes a wonderful scent for your homemade laundry needs. EUCALYPTUS- Eucalyptus is a great oil to add to your natural dryer sheets, giving off a fresh clean and crisp smell. CEDARWOOD- Another one for the men in your life. Cedarwood has a woodies scent that most men enjoy and it has cleansing properties making it great for your laundry. 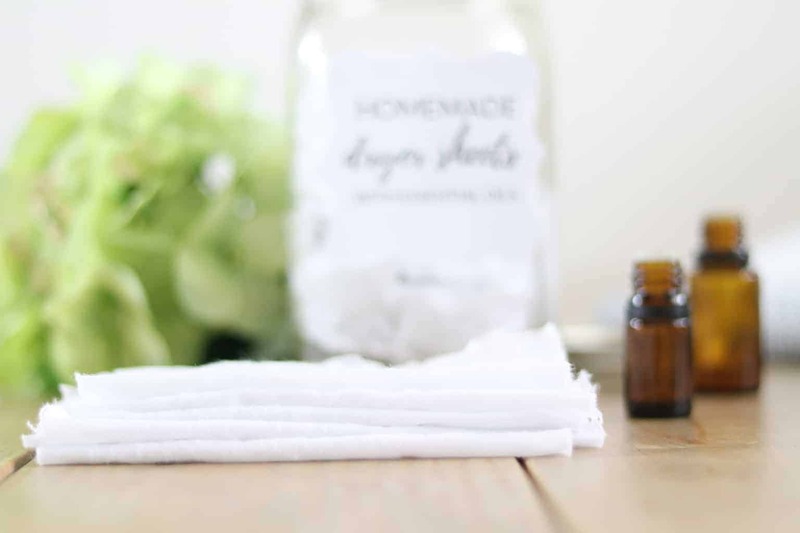 WHY HOMEMADE NATURAL DRYER SHEETS? Regular dryer sheets are loaded with harmful chemicals and fragrances. Though they smell nice, they can cause skin reactions and cause other health complications. If you have sensitive skin or have to buy unscented laundry soap or dryer sheet, try this recipe! My homemade laundry soap and these natural dryer sheets are great for those who have sensitive skin. It is even gentle enough for babies. Have you ever made your own dryer sheets or laundry soap? Which blend of essential oils did you add in? Fold the fabric pieces to fit inside of a mason jar or other airtight container. Pour the vinegar and essential oil mixture over the cloth wipes. I made 12 cloths and used all the liquid. If you make less you may not need all the liquid. You don't want to saturate them. I love your videos! I looking for a homemade wood furniture cleaner? Any ideas!